Sleek, chic and elegant; these Black Paper Napkins will add a stylish essence to your party and keep your guests looking clean and happy. After all, black does go with everything. Perfect for holiday parties, barbecues, birthday parties and anything else you can think up, Black Paper Napkins are sure to match well with whatever theme you have in mind. From white plates for a classy look to gold cups for a New Year's Eve theme, even orange plates for a Halloween party! Available in a variety of sizes, these napkins will keep you and your guests clean and looking sharp through drinks, appetizers, dinner, and dessert! 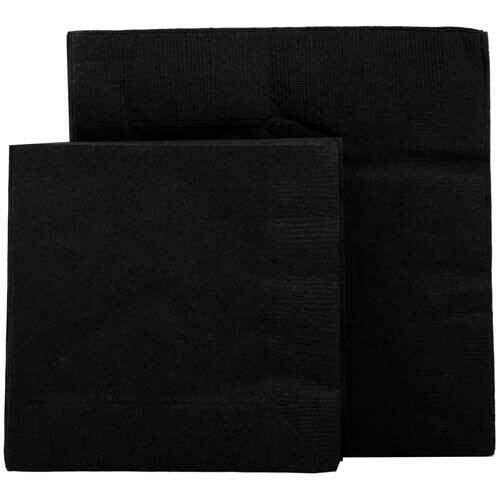 Black Paper Napkins are available three different sizes -- Small Beverage Napkin 5 x 5, Medium Lunch Napkin 6.5 x 6.5, and Large Rectangular Guest Napkin 8 x 4.5. Love the color and want to complete your tableware? Check out our other black disposable tableware that can be located under 'Other JAM'n Products You Might Like'!